Ready, Set, Grow! 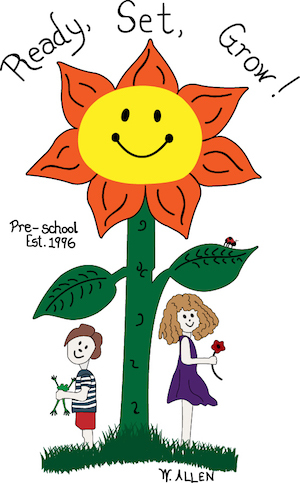 Preschool – A cooperative preschool focused on developmental learning. NOW ENROLLING! Ready, Set, Grow! Preschool is honored to be the first parent participation (or co-op) preschool in Wildomar. We are excited to be able to provide this terrific experience to families, neighbors, and our community. The true beauty of a co-op preschool is a parent contributing their time and talents to their child’s school and thus all parents working together to create a fun and stimulating learning environment for all children. We believe children learn from their parents as well as from their teachers. Thus, parents are scheduled and included in the school’s daily activities. Children benefit from parental involvement by seeing their parents willingness to be part of this special time. By working together, parents and the teachers will model proper social skills. Parents benefit from the involvement in seeing their children grow and mature. "My daughter and I loved our time at Ready Set Grow Preschool. The nurturing, creative, hands on approach to learning is wonderful and getting to be involved in the process meant so much to me"
"This school is amazing. We have two generations of my family that have attended here and the benefits and memories made here are clearly lasting for both kids and parents. This time is so precious in a child's life and RSG helps families be a part of it in amazing ways. My daughter has grown here mentally and socially so much in the last two years and I know she will continue to grow with the foundation provided here. The teachers are incredible, smart and excellent examples for kids and families alike. We have gained so much from being here and I would highly recommend to anyone wanting to build strong, healthy, happy kids and memories that will last a lifetime!" "Miss Cheri is my teacher and I love the way she sings and reads stories to me"
"RSG is a wonderful preschool! Their teachers are amazing and the kids love them! Being a co-op type school gives us parents, the opportunity to be a part of our child's preschool experience. The kids have a fun-age appropriate activities that involve lots of imagination and play time. My son has really blossomed during his time at RSG. His teacher is very patient and kind. We love RSG"
"My daughter and I love this preschool. This is a school where your child won't be another name on a list. The teachers and parents put there hearts into this school and our children benefit greatly from it. This school is all about the community coming together for the child. My daughters teacher Mrs. Alyssa is so loving and really cares for the individual needs of each child. We have made some amazing memories at this school and I would recommend this school to anyone I know who wants to take an active part of there child's first years in school." My daughter started RSG last year when she was 3....She has grown so much socially. It's such a great program not only for your kiddo(s) but for you too! You can be apart of their growth. Working in class with them is super special! And Mrs. Alyssa is GREAT! If you're looking for an AWESOME CO-OP; then READY SET GROW! is right for you!"